A cylindrical pipe with cap, louvered on four sections and open at one end. 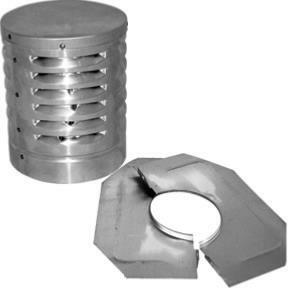 An effective way to terminate your system, designed to enable the flue gasses to escape. Also doubles as a birdguard ensuring that birds and debris will not be able to enter the flue helping to prevent dangerous blockages. The terminal can either be mortared into place or screwed to a liner if there is any exposed at the top of the chimney pot.